We are touch-up specialists, making your Furniture, Kitchen Cabinets or Woodwork look like new, without stripping the finish. 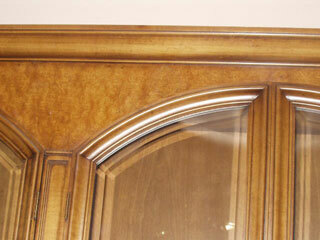 We repair damages such as scratches, dents, chips, gouges, water marks, pet damages, etc. in residential and commercial settings (Please see our Portfolio). Even severe damage such as the burn below can be dramatically improved. 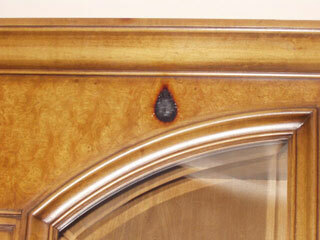 There are several advantages to furniture touch-up rather than complete furniture refinishing. Since the work is done on-site, there are no pick-up and delivery charges, and you have almost continuous use of your furniture. Touch-up is less expensive than stripping and refinishing, and much less than furniture replacement. Ron Feinman, President of Touch Up Artistry of NY, is a master touch-up artist. Since 1987 he has earned a reputation in the New York metropolitan area for his meticulous repairs, reliability, and uncompromised integrity. Clients are always amazed at Ron’s ability to make unsightly problems disappear. Who uses Touch Up Artistry of NY? Furniture and Kitchen Retailers and Manufacturers use our furniture repair services to resolve customer complaints about factory defects and handling damages, eliminating the need for costly replacements. Project Managers, Architects, and Building Developers rely on Touch Up Artistry to handle punch list items on kitchen cabinets and millwork in preparation for buyer walk-throughs. Professional Offices that want to make the right impression on their clients and staff use us to maintain their office furniture (and their image). Moving Companies and Insurance Companies use on-site furniture repair service to resolve accidental damages and control costs. We can provide digital pictures and reports when needed. Discriminating Homeowners who know that occasional touch-ups of accidental damages, wear and tear, and pet damage, keeps their furniture and kitchen cabinets looking good and helps them avoid the eventual need to strip and refinish. In addition to repair services, we enjoy educating our clients about proper maintenance so they can extend the life of their furnishings. 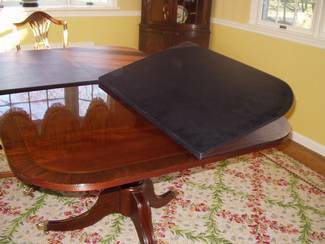 Avoiding accidental damages can be achieved in many ways including the use of table pads (see Care and Maintenance). Most of our work is in Nassau and Suffolk Counties (Long Island), but we also operate in Manhattan as well. If you are seeking a master craftsman for restoration of furniture, cabinetry or millwork in a residential or commercial setting, please contact us by email, or call us at 516-944-7459 to discuss your needs. We proudly offer protective table pads by McKay and MagnaLoc. These pads are finely crafted to protect your table from accidental damages. Protect your furniture and avoid costly damages that can happen all too easily. 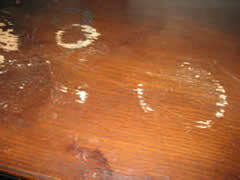 Don’t let this happen to your table! Touch Up Artistry of NY, Inc.